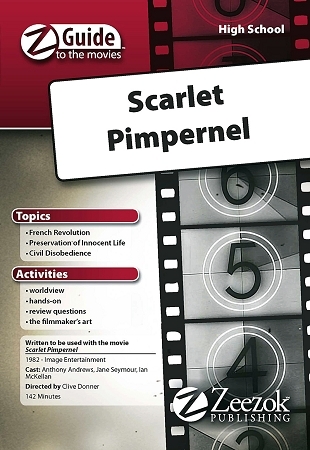 Zeezok Publishing's Z-Guide to The Scarlet Pimpernel is a great way to incorporate media into your study of the French Revolution. Ride with Sir Percy Blakeney as he and the members of the League of the Scarlet Pimpernel rescue French aristocrats from the guillotine during the Reign of Terror. Will Paul Chauvelin chief agent of the Committee of Public Safety discover the Scarlet Pimpernels identity and thwart the Leagues plan to rescue the young heir to the French throne? Get ready for an action-packed adventure filled with spies counter-spies intrigue romance and nail-biting suspense during the climactic events of the French Revolution. The Scarlet Pimpernel guide contains a topic overview movie synopsis and ten learning activities based on this exciting film. Complete a chronology of the French Revolution define some French vocabulary summarize changes produced by the revolution design your own rescue plan to assist the condemned prisoners draw a Wanted! poster for the Scarlet Pimpernel and discuss your personal view of civil disobedience based on Sir Percy's actions. Probe the directors mind with The Filmmakers Art activity and engage the students siblings with the For Family Discussion section. A brief bibliography lists suggested resources for additional reading. So don your disguise slip undetected into revolutionary Paris and join the League of the Scarlet Pimpernel! Movie Summary: The swashbuckling classic comes to rip-roaring life in this lavish production filled with breathless romance and derring-do! In the eyes of high society Sir Percy Blakeney (Brideshead Revisited's Anthony Andrews) is a typical fop surrounded by adoring ladies and clueless gentry. However he is also a master of disguise and bears an infamous secret identity: the Scarlet Pimpernel dashing and fearless rescuer of victims of the French Revolution! Sir Percy also falls head over heels for the beautiful Marguerite (Somewhere in Time's Jane Seymour) who is also wooed by the villainous Paul Chauvelin (The Lord of the Rings' Sir Ian McKellan) Robespierre's Chief Agent for the Committee of National Security. Suave stylish and utterly irresistible this dazzling adventure is sure to capture your heart! This Z-Guide is based on the movie Scarlet Pimpernel (1982). You can view a trailer for the movie below.